Hi. My name is Louise and I live with my husband and two girls (3 and 8yrs) in Austinmer NSW, just south of Sydney. 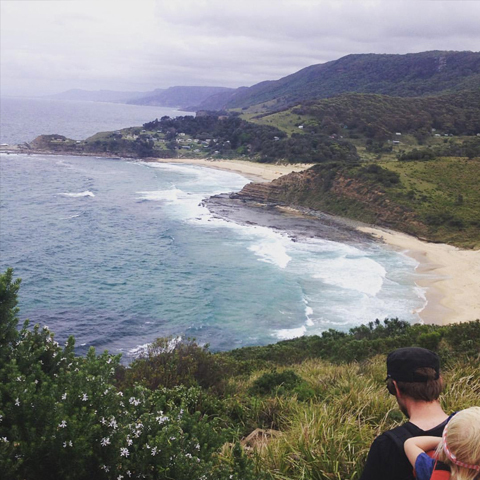 We chose to move from Sydney 5 years ago to escape the congestion and to be closer to nature. Living by the sea and the mountains was a way to find time and space to reconnect with my drawing and it also provides a lovely lifestyle for the girls. Coastal walks nearby are a great way for all of us to unwind and explore nature. I studied Fine Arts at University and channelled a love of the visual image to work as a Graphic Designer for over 20 years. Having worked predominantly with digital design, I wanted to return to traditional drawing, but I could never find the time or focus to do so. After attending a weekly printmaking class, I rediscovered how therapeutic and rewarding drawing and art are to my life. An early etching of my first born when she was 2 (now 8yrs). I started selling some of my prints and drawings with a friend at the local markets - under the business name Drawstring Handmade. I was inspired by all the support and generous feedback from locals and on social media. My drawings started to develop and in-between being a mum and working as a freelance designer, I found time to keep exploring my style and improving the quality of my work. …or I use digital colouring techniques. I am now combining traditional drawing skills with my computer graphics experience, to create very intricate, vibrant and unique images, with a particular focus on birds. I really love the detail and shape of feathers and I’ve been inspired by so many of our amazing Australian birds. The great thing about drawing is that you don’t really need a dedicated studio, you can be anywhere with a pencil and some paper and create. So many of my drawings start while I’m waiting for my little girl to wake up from her midday nap, it’s a wonderful way to fill in time which otherwise might be wasted. For the digital colouring work, I have my studio, the third bedroom in our house, which over-looks the garden and trees and I’m frequently visited by king parrots, sulphur crested cockatoos, bower birds and wrens. 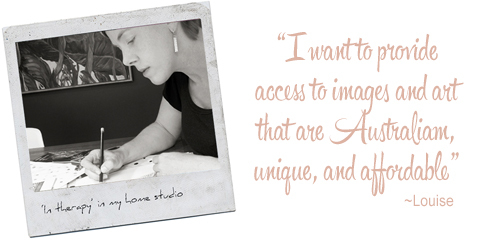 Where I live in the Illawarra, I am surrounded by so many amazingly talented local artists and makers. It’s very inspiring to see so many uniquely creative and well designed products, created right here in my area. Our local artisan markets are among the best and the local community are always very keen to support handmade, which makes for a great experience. I get a little angry when I see some of the big chain stores copying independent designers because they steal the image but forget the individual stories, the thought, effort and quality that the artist put into creating that image. Online markets like Made It help to create a community of people who understand that Australian handmade products are uniquely beautiful. Made It’s support of arts and crafts is a way to keep traditional making skills alive and it is an important platform for sharing and promoting a distinctively Australian creative spirit. This year, my focus is to keep creating images that depict our local flora and fauna in a contemporary and vivid way. I think it is important to fill our lives, homes and work spaces with well made, beautiful things. To be surrounded by great colour - interesting and inspiring images - makes our everyday lives more enriched.